How and Where to Buy Lipitor Online? You can buy Lipitor online through our Canadian International Pharmacy at huge savings. We offer RX and OTC medications online with a valid prescription from your doctor. At Canadian Pharmacy World, your health is our priority. You can place the order online, by mail, by fax or toll free over the telephone at 1866-485-7979. Are there Alternative Names for the Brand and Generic Lipitor? Canadian Pharmacy World also carries other Cholesterol medications such as Crestor and Zetia. What Dosages and Forms is Lipitor available in? Lipitor is available in the dosages of 10mg, 20mg, 40mg and 80mg tablets. The brand Lipitor is a white elliptical or oval shaped pill with the pill imprint of the dosage on one side of the pill and PD 15- on the other side of the pill. Lipitor (Atorvastatin) belongs to a group of drugs called HMG CoA reductase inhibitors or “statins”. This medication is used to treat high cholesterol and to lower the risk of stroke and heart attacks if combined with a proper diet. 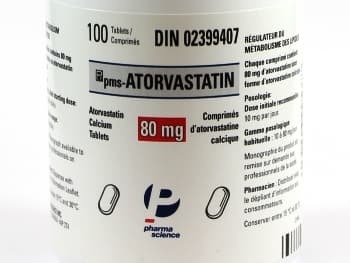 Atorvastatin works by reducing the amount of cholesterol made by the liver. Lowering the bad cholesterol and raising good cholesterol decreases the risk of heart disease and prevents strokes and heart attacks. Lipitor is usually taken once a day with or without food. Are there any Precautions or Drug Interactions for Lipitor? You should not take Lipitor if you are allergic to Atorvastatin. Discuss your medical history with your doctor before you start taking this medication. Limit alcoholic beverages. This medication should not be used during pregnancy or if you are breast-feeding. Do not eat foods that are high in fat or cholesterol. There may be an interaction with Lipitor and other medications such as gemfibrozil, telaprevir, tipranavir and ritonavir. You should avoid eating grapefruit or drinking grapefruit juice while you are taking Lipitor. This medication should be taken regularly in order to get the most benefit from it. Atorvastatin should not be used by anyone younger than 10 years old. Lipitor should be stored at room temperature away from moisture, heat, and light.